I haven’t been thrifting for ages, my heart just wasn’t in it. However, yesterday Sophie dragged me to SaveMart on a quest for the perfect pair of jeans. We had already trawled most of the malls in town plus the outlets stores trying to find a pair that fit her. She’s such a petite being and she’s fed up with having to buy clothes from Pumpkin Patch. At 13 years old, she really deserves something more college than kindy. She’s about to start high school for heavens sake. I got side-tracked by someone’s vintage fabric stash. Including this amazing piece printed with postage stamps. 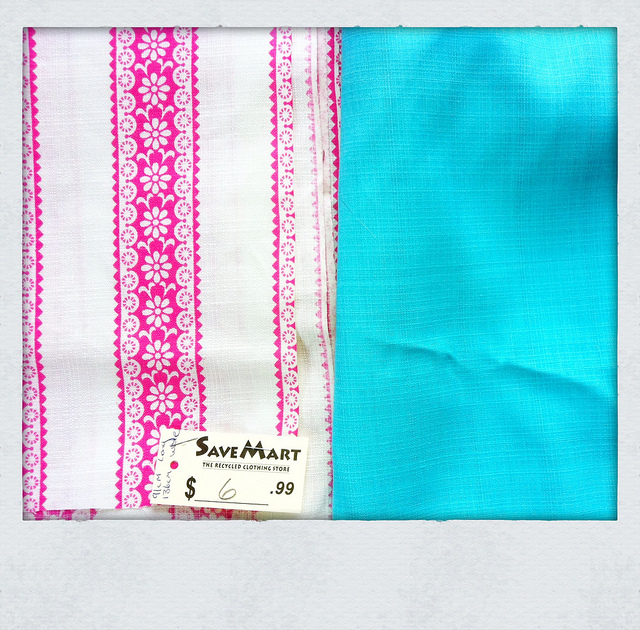 And lots of vintage linen including this lovely aqua blue and a pink and white candy-striped affair. Almost 4 metres of each. 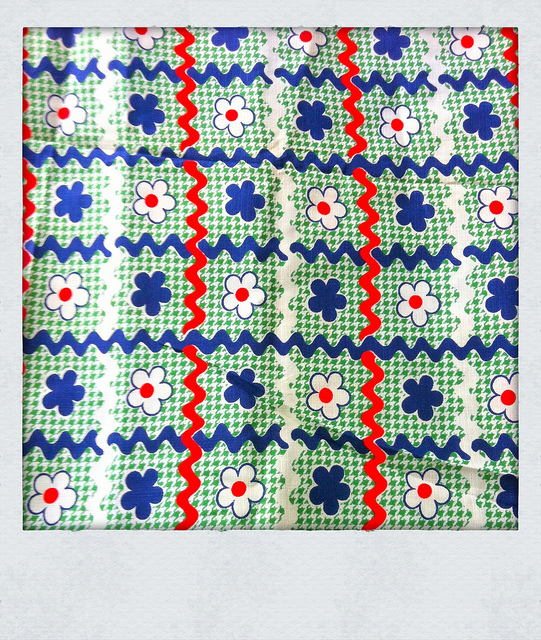 Oh oh and my personal favourite – a green fabric with red, white and blue printed ric rac and red, white and blue flowers. 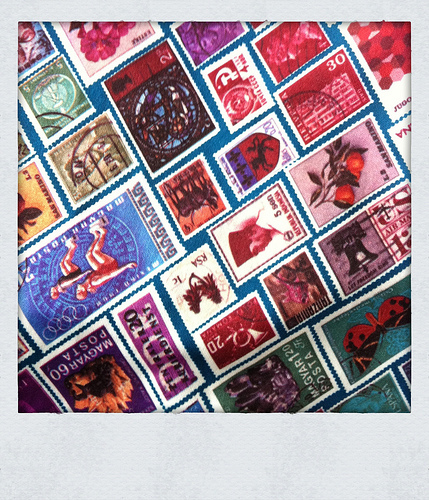 If I was 6 years old again I would covet a pinafore made out of this to go with my red Mary Janes and navy blue tights. Like dream about it when I should have been learning fractions or something. I failed to notice Sophie standing right there beside me, flicking through the fabrics too, sporting the perfect pair of perfect fitting perfect length jeans. Just Jeans. Eight dollars. What a winner. I wonder if she’d like a pinafore to go with them? Score! It’s nice to see you back Miss Flossy – I wondererd where you’d been and hope all is well in your neck of the woods. I imagine Life with a capital L must have intervened somewhere in the last wee while .. The savemart is great for clothes, I love the way they have sorted everything. Although I noticed last winter that they (in Napier) seriously put up the prices with everything that had merino in it; I don’t buy a secondhand top for $32 if I can get one new for $35. She couldn’t wait to get out of them when she got here! 22deg but humid – hot and sticky reigns. On today’s itinerary is Westfield Manukau (especially the Supre outlet), Dressmart (inc Just Jeans, Urban Angel, Levis, Canterbury, etc etc etc), Sylvia Park, and then Botany. Tomorrow I’m thinking St Lukes, Lynmall and/ or Takapuna and maybe go as far as Albany. Round out the day with fish n chips on Mission Bay. Suspect we’ll be sick of malls after all that… so will do crafty things. Picked up some cool 1:12 miniature room kits last week and they made a start on one last night. Oh love the green, ric rac number. Good score! Can’t wait to see what you make.